Welcome to the archives here at Kingsbury Barn. Have a look around. Kingsbury Barn has a long story, and much of it is still waiting to be discovered. The current building is the most recent on these foundations – and it was built over 600 years ago, in 1374, on top of a Roman building, which lay alongside the Roman Road to Colchester. It is not clear if this Roman building was a residential building or a commercial one, but it was next to the road just outside the city walls. Kingsbury Barn now lies outside the city of St Albans and on the edge of St Michael’s Village. At some point the medieval road was diverted from the Roman road to go around the site. Quite why this should have happened is not clear. The present building is one of a group of barns built in a relatively short period by St Albans Abbey, under John Moote who was first Cellarer and subsequently Abbot. Adrian Gibson, who has studied this group of barns, thought the Abbey pursued a policy of upgrading its farm buildings in an attempt to attract tenant farmers in the years following The Black Death, which had severely diminished the labour force of the Abbey lands. 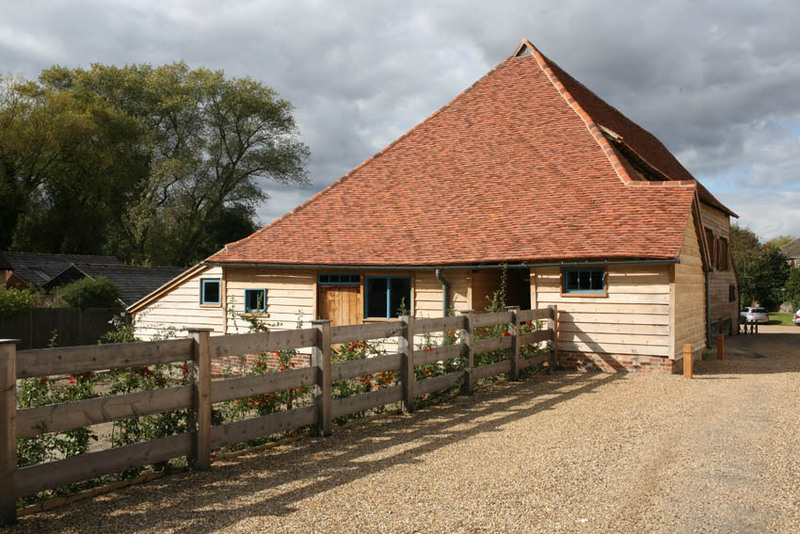 Kingsbury Barn was part of the farmyard for Kingsbury Manor. In the mid sixties the farmhouse was sold, but the farmyard was retained by the Gorhambury Estate. It had housed Kingsbury Dairy while attached to the farm, but in the mid fifties Express Dairies leased the site although Gorhambury Estate retained Kingsbury Barn until the house was sold, using it for the processing and distribution of animal feed to the estate farms. After the mid sixties Kingsbury Barn was used by Express Dairies, although by the time they left the site in 2004 its only use was to house the Lions’ Christmas float. The site was then bought by Henry Developments, who intended to use the site for housing, and turn Kingsbury Barn into offices. Feelings ran high and for three years local residents objected to the developers plans to convert the building. Eventually Henry Developers sold the two barns on the site, Kingsbury Barn and the Branch Road Barn, to Jill and Adam Singer, who live in Kingsbury Manor and the barns were reunited to the farmhouse. They began the process of restoration. There will be more about this story in later postings. This is the beginning of the road to find a future for this stunning building. It was open for three days over the Heritage Weekend in September 2009, when over 1100 people visited. From Branch Road it appears to sit low in its surroundings, but everyone who comes in through the huge cart doors in the south look up and are amazed by its lofty and cathedral like interior space. What is the future for this building? Watch this space as we try to find a way for it to have a function for its community, and for the twenty first century, so that it has a new lease of life that enables it to retain its special qualities and be safe for the future. Any ideas would be received with interest at info@kingsburybarn.co.uk ! 04.02We are pleased to announce that we have now launched our website.